This St. Augustine blog touches on all topics relevant to local happenings and vacation activities in the nation’s oldest city. From the great things to do, fun events and delicious places to eat, the articles bring it all to one place for visitors and residents alike to read and enjoy. Our bloggers provide a unique perspective for all walks of life. View the blog to get tips and reviews on new restaurants in St. Augustine. Our bloggers cover all the new places to eat, and classic landmark restaurants to dine at. 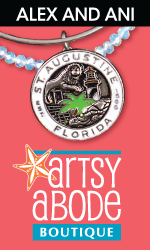 St. Augustine has lots of popular upcoming events, so read the blog and get the scoop on what's fun in town. If you're looking for more information about what to expect at local attractions, the St. Augustine blog is updated with fun experiences for the whole family. Check back for updates. Explore the nation's oldest city on Spring Break 2019 and become a part of the action in St. Augustine. 2019 marks the 60th Annual Easter Parade in St. Augustine and the first time the parade will be held on the Saturday before Easter. The parade steps off at 9:00 a.m. on Sat., April 20, 2019. St. Augustine's Easter Parade shows off the history and tradition of the nation's oldest city, with some delightful surprises thrown into the mix! Have a healthy and happy 2019 in St. Augustine! Find all the important info on navigating Light Up! Night with St. Augustine's Nights of Lights! Not for your professional golf fans -- these tips are for the clueless newbies like me attending TPC Sawgrass for the first time. Check out this local guide to literary sights and bookish experiences in St. Augustine and the surrounding areas in Northeast Florida! Find out what makes St. Augustine the best place to come for the holidays.